In case I haven’t mentioned this before, I AM GOING TO PARIS FOR 5 MONTHS. Starting in January, I will be studying at L’Universite de Paris and living with a French family. More or less I’m going to be a Parisian in training. Get ready for some delicious French cooking, friends. Or should I say: mes amis. I requested that I get placed with a family that will teach me how to cook (priorities, I know) so I plan on continuing en France. So you will be hearing from me abroad, d’accord? ANYWAYZ I’m leaving for home in 2 weeks, which means I’m trying to use up as much of my baking supplies as possible. I have tons of whole wheat flour left, and I was fresh out of bread, so I figured why not! Back to the topic at hand: bread. I made a no-knead white bread (that you all should try if you haven’t already because it is FABULOUS as well as fabulously easy to make) back in October and I figured it was time for the wheat variety. I used all whole-wheat flour and even though I’ve heard things about how the no-knead method doesn’t work as well for whole wheat as it does for white because it’s a heavier flour, it turned out pretty great! I noticed a little difference just in the density of the bread–this one is a little denser/less light and fluffy, but still delicious all the same. 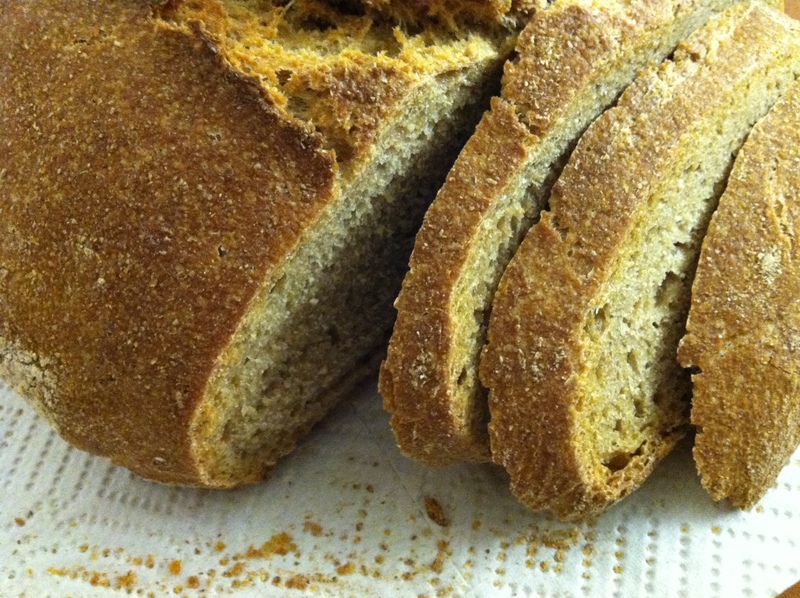 If you’re a whole-wheat-over-white-bread kinda person, try this out. It works quite nicely. Mix together all ingredients in a big bowl until just combined into a dough. Cover and let rise for at least 12 hours (I let mine rise for almost 20–I’d say the longer the better but it doesn’t reeeeally matter). Once it has risen, pull the dough out of the bowl onto a well-floured surface. fold it once, turn it 90 degrees, fold it again, and form it into a round shaped loaf. Preheat the oven to 475 and let your pot and lid heat in there as well for about 30 minutes. After that time is up, carefully remove your pot from the oven, put your dough inside, and replace the lid. Bake for 30 minutes, remove the lid, and bake for an extra 20 with the lid off. Once you take the bread out of the oven, let the pot and bread cool for a while (at least 15-20 minutes) before you even touch it. Once you remove it from the pot, let it cool completely before you cut it. Voila! Delicious Bread! Now, breathe in the smell of your freshly baked loaf and pat yourself on the back for being such a successful baker. And go make yourself a piece of toast in celebration. 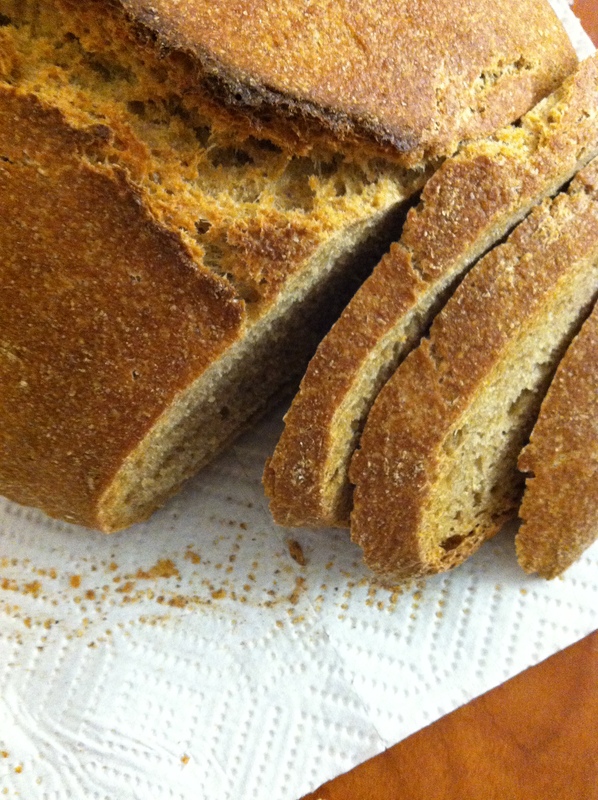 Categories: Breakfast, Snack | Tags: bread, no knead, wheat bread, whole wheat | Permalink. So APPARENTLY there’s a gigantic storm a brewin’. Frankenstorm, if you will. So naturally, my first thought when faced with the harsh reality that we may not be able to leave our homes for three days straight was: I BETTER BAKE SOME THINGS ASAP. I planned on baking a bunch. I have perishables that could be baked into things, so why not use them while I still can, ya know? (There is also a chance that we might not lose power at all and that all of this baking will end up being a little unnecessary…but where’s the fun in that?) But seriously, guys! What am I supposed to eat if the power goes out and all our refrigerated things go bad? Well, muffins of course. And some brownies…but we’ll get to those later. All of my friends/roommates/their parents/my parents are freaking out about being safe in the storm and staying away from windows blah blah blah and my biggest concern is “what’s going to happen if all my food goes bad?! And WHAT AM I SUPPOSED TO DO IF THE POWER GOES OUT AND I CAN’T USE THE OVEN OR THE STOVE?” But really though. What on earth am I supposed to do. Looks like I’ll be living off of dry granola, almonds and room temperature soup for three days. It better not come to that. I will be heated. My first order of business was to bake something that could kiiind of maybe pass as somewhat healthy, since we were going to be eating a lot of this for the next couple of days. Soooo muffins with chocolate chips? Of course. I loosely based this recipe on this one from allrecipes.com. These really aren’t that bad though! And they’re quite yummy. Just a pretty standard muffin, but it does the trick when a muffin craving strikes. Or as a hurricane survival snack, ya know. Combine the milk and oats and set aside to sit for a little. Preheat the oven to 400 and grease/line a muffin tin. Add the egg, yogurt, and 1/2 c. of your brown sugar and mix until combined. In a separate bowl, combine your dry ingredients (flour, baking powder and salt) and combine the two mixtures together until juuust incorporated. Fill your muffin tin with the batter and sprinkle the remaining brown sugar on top. 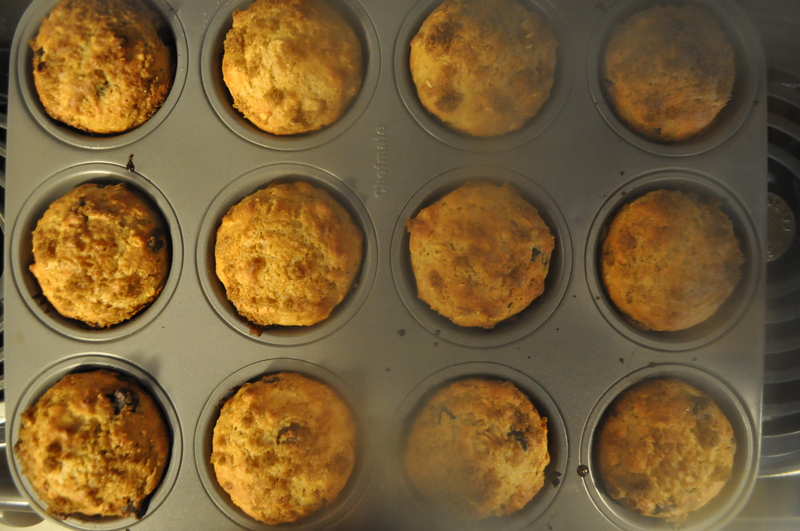 I made exactly 12 (rather full and round, but not too full) beautiful muffins. Bake for 18-25 minutes depending on your oven; the original recipe said 20-25 but at 20 minutes mine were already the teensiest bit toasty so I’d recommend you check them a little early! Stay safe, east coast buddies! Stay tuned for my hurricane brownies recipe. Let me tell you, it’s a good one. Categories: Breakfast, Snack | Tags: breakfast, chocolate chip, muffins, oatmeal, snack, whole wheat | Permalink.